Ayima’s preliminary sales figure for the month of Sept 2018 is 23.1 MSEK, a 24% increase from the same period in 2017 (18.6 MSEK) and the highest sales month in the company’s history . The Sept figure includes only 0.4 MSEK from LeapThree, the newly acquired company, which was consolidated into the group during the 2nd half of the month. During the current year, Ayima has consistently shown high double digit growth, compared with the corresponding period in the previous year. 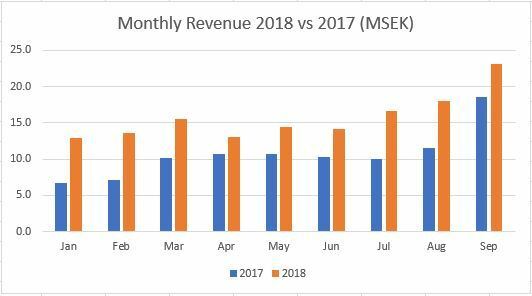 After 3 quarters of the current year, total YTD Revenue of 141.5 MSEK already exceeds the full year Revenue achieved in 2017 (129.6 MSEK). Originally founded in 2007, Ayima is a digital marketing agency with around 150 employees across its offices in London, New York, San Francisco,Stockholm and Vancouver. Ayima have created a number of market-leading software tools that are used in by clients and agencies around the world, including ‘Updatable’, ‘Redirect Path’, ‘Page Insights’, ‘Pulse’ and ‘Appotate’. Ayima is listed at Nasdaq First North under the “Ayima B” ticker. Certified Adviser is Eminova Fondkomission AB (http://www.eminova.se). This information is insider information that Ayima Group AB is obliged to make public pursuant to the EU Market Abuse Regulation. The information was submitted for publication, through the agency of the contact person set out above, on October 5, 2018. Please fill out this form so we know how best to help you with your marketing goals. Subscribe to our newsletter where we share all the latest news, tips and insights in digital marketing wrapped up into one monthly email. Don't worry, you may unsubscribe from the newsletter at any time.